The Tote-a-Vision is a Portable Vision Board. 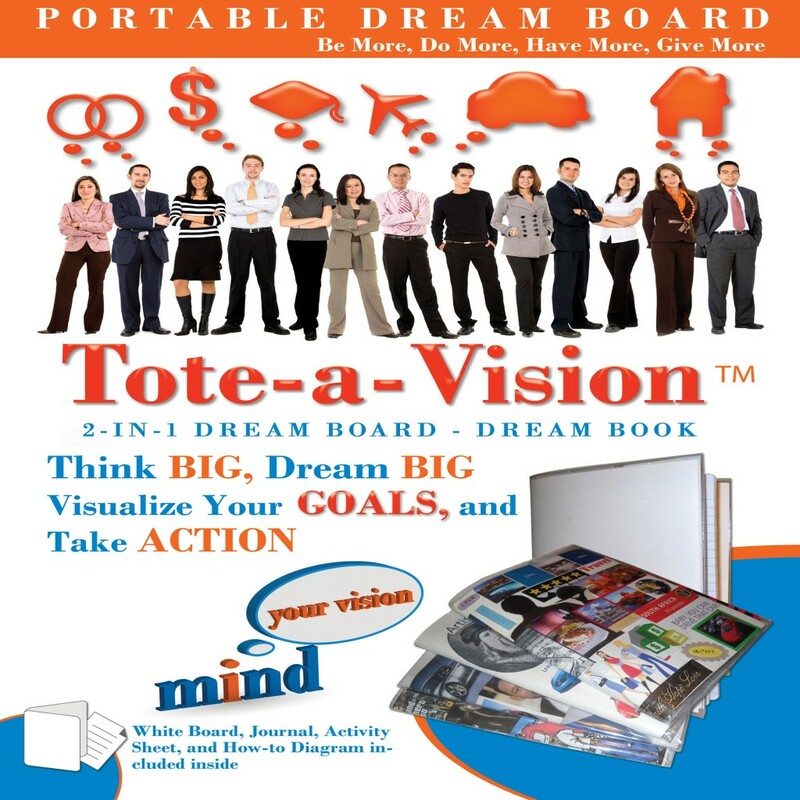 – The Tote-a-Vision™ is precisely that… It’s your portable vision board that gives you the ability to carry your goals in a visual form where ever you go. Up to three vision boards can fit comfortably within the body pocket at one time. The tote-a-vision™ is a clear transparent vinyl sleeve with a large pocket opening on the top edge to insert your vision boards. It includes a customized white poster board, journal and How-to Diagram.Refer to the “how-to” section for instructions on how to create a portable vision board as well as ideas on the different themes to consider for your vision boards. Visit the Vision Board Gallery to view Creations by others. Portable and Easy to carry your a visual representation of your vision, dreams, and goals every where you go. Vinyl sleeve fits comfortably around a traditional composition notebook as a book cover. Now you have a place to journal and write down your vision, dreams, and goals. Your vision board becomes the cover of your journal. By Popular Demand – the Tote-a-Vision Vinyl Sleeves are now available in Bulk order… Each sleeve comes with two cut to size white poster boards to fit comfortably inside of pocket. Create multiple portable vision boards easily with this bulk order option! This package includes everything you need to dream-build, plan, and actively work towards your financial freedom goals. 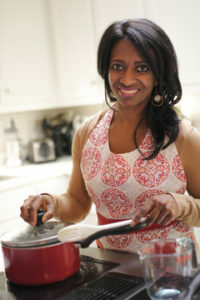 It incorporates the necessary aspects of goal achievement, such as helping you to create a visual representation of your dreams and goals, a place to write down your goals, ideas, affirming statements, and milestones, and the workbook guides you through specific steps for financial achievement. 1)Use the Tote-a-Vision white board to create you personal vision or dream board. It will help you to clearly visualize your goals, dreams and desires. 2) Use the Tote-a-Vision journal to write down your goals, ideas, milestones, and results. 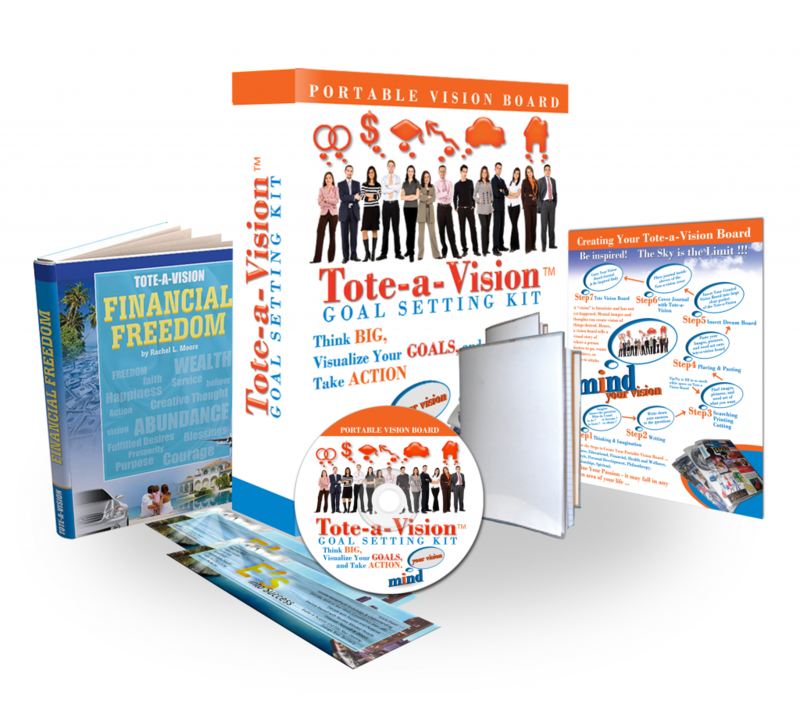 3) Use the Tote-a-Vision Financial Freedom workbook to discover a clear direction to planning your financial success. the right mindset to attain financial prosperity. Within these pages you will be guided with how-to steps. The tracking system suggests elements of proven methods to incorporate within your daily activity during your 30-60-90 challenge. The same process that’s laid out for 30 days can be reapplied to 60 or 90 days. The longer you stick with your focus, the better the results. “As an entrepreneur, I face daily challenges in growing my business; the biggest challenge all entrepreneurs face is doubt, fear, and discouragement. The Mind Your Vision to Freedom program provides support for every challenge, through the simple, step-by-step modules and workbook, the physical reminder of the Tote-A-Vision that I carry with me daily, and especially through the unflinching, “unshakeable faith” of Rachel Moore. 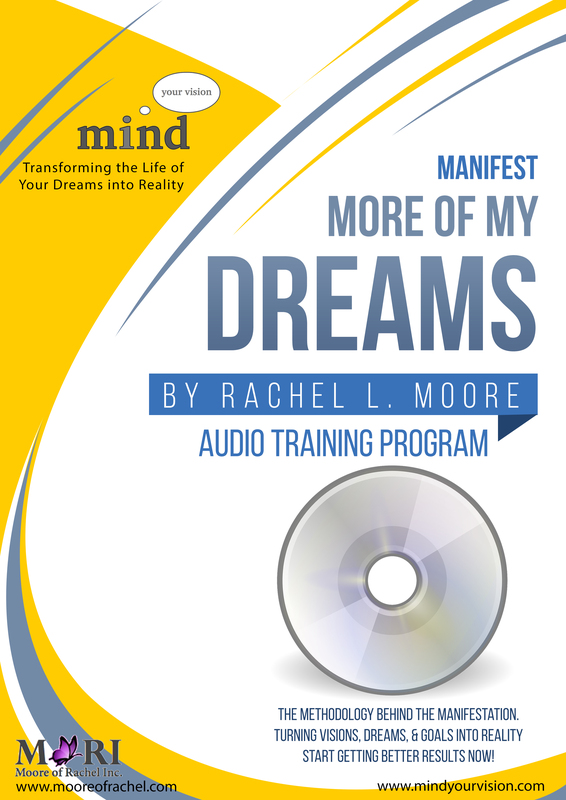 “As an entrepreneur and a single mom, I’m amazed at what manifested in my son’s life in less than three months of the two of us taking Rachel’s Mind Your Vision live program. We learned several valuable goal setting techniques that we now consistently apply in our life. Some of the very same information we learned is within the Tote-a-Vision Financial Freedom workbook. We have made our Tote-a-Vision dream boards with journal apart of our daily lives.